The migrant had been inside the wire of the Libyan detention centre for just 10 minutes when the beatings began. Picked up by police in Tripoli he knew that, without money or papers, and from Eritrea, he was at the bottom of the pecking order. The detention centre at Gharyan in Nafusa mountains, 100 miles south-west of the capital, is notorious for allegations of mistreatment. Like most of Libya’s 19 migrant detention centres, each holding up to 6,000 people, Gharyan is also packed to overflowing. Yet the centres are the country’s only answer to the tide of migrants arriving in the hope of getting to Europe. 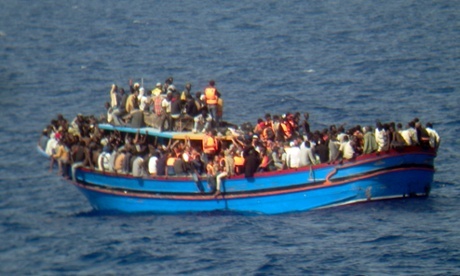 Sixty-three thousand have made it across the Mediterranean to Italy so far this year, more than the total for all of 2013. Hundreds of thousands more are waiting for a boat in Libya’s coastal cities, or clawing their way north through the Sahara. The labour ministry said in April that an estimated three million undocumented migrants and refugees were within Libya’s borders. They flee war in Syria, Iraq and Somalia, oppression in Eritrea and Ethiopia or poverty in Cameroon, Senegal, Niger and Sierra Leone. It is mass migration on an epic scale, made possible because the collapse of government authority has turned Libya into a gigantic funnel to Europe. 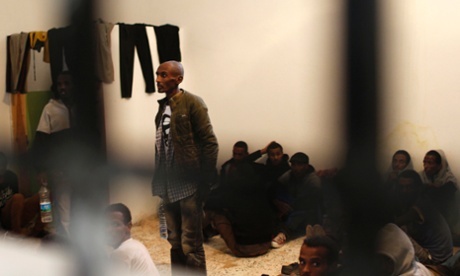 Human Rights Watch reported that at eight of the nine detention centres it visited in Libya , Gharyan included, inmates complained of being locked in shipping containers, beatings with weapons, rotten food and punishments including whippings and being hung from trees. These centres are officially run by the interior ministry, but such is the chaos in Libya that most have no supervision. The guards at Gharyan told the Eritrean migrant that he could go if he paid $1,000, a practice said to be common. He will not say how he raised the cash, but most detainees do it via wire transfers from relatives in the west. After three months he was free, resuming his hunt for a boat to Europe. Home now is two grimy mattresses in a tiny room he shares with his wife and three-year-old son in Tripoli, in a tenement with hundreds more migrants, packed 20 to a room. All are desperate to find passage to Europe. But he said even this was better than being back in Eritrea, one of the poorest and most oppressive countries in the world. And he is grateful to be alive. He has been waiting for a boat for four years, first arriving in Tripoli with his wife during the dying days of the Gaddafi regime. When the Arab spring exploded around him in 2011, they fled to Tunisia, to a UN camp set up for refugees from Libya. After the camp closed last summer, they returned to Libya, once more hoping to cross to Europe. Eritreans are one of the largest migrant groups in Tripoli. 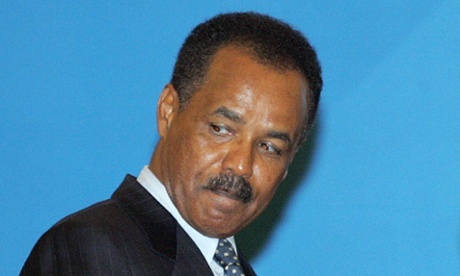 The UN blames Isaias Afewerki’s draconian rule, including compulsory military service for a large chunk of the population, for widespread poverty and drought. This exodus is largely financed from other Eritreans already in Europe, with relatives wiring money to them through Western Union and other money transfer firms. They pay $400 to cross the Libyan border, as much again for passage to the coast, followed by payments for accommodation and then the boat to Europe, with prices starting at a $1,000. Those making it across the sea pay the money back from wages or social benefits, but not everyone makes it. At St Francis church in Tripoli run by Italian Franciscans, the mood among staff of the Catholic charity Caritas was sombre. As they handed out nappies, food and medicines to Christian Eritreans queuing among peacocks and rabbits in the sunny courtyard, they mourned three Eritrean medics, Michael, Peter and Askallo, who treated fellow migrants at the church until they found a boat to Italy. The boat capsized, and they drowned along with Askallo’s six-month-old baby. “Michael was a very friendly guy, but he felt he just had to go,” said Dr Hermilo Villayson, a Filipino doctor who attends to migrants showing up for free treatment each Friday. Along Libya’s 1,000-mile coast similar dramas unfold each day as small boats set out off for Europe. There are two main embarkation points for migrant-smuggling: Zuwara, near the Tunisian border, and Garabulli beach, 80 miles east of Tripoli. Both are chosen for their proximity to the Italian coast and their lack of security forces. Zuwara is an ethnic Berber town, which no longer recognises the Libyan government, and Garabulli is far from the coastal highway. The crumbling of state authority, with parts of Libya now a war zone in a widening conflict between Islamist and tribal forces, has allowed people-smuggling to become big business. A network of agents across Africa and the Middle East assemble convoys of migrants for the long trek to Libya. Then agents in Tripoli put them in touch with people-smugglers. Near Zawiya detention centre, 30 miles along the coast from Tripoli, guards took delivery of a truck that was stopped heading west to Zuwara. They were not surprised to find 200 people, including pregnant women, crammed in the back, along with a corpse. The occupants climbed out in silence. “We do our best, but we do not have the proper equipment to ensure the respect for these people,”said Khaled al-Tumi, head of the Zawiya’s counter-illegal migration directorate, which is run by the interior ministry. The men were put on to a truck and a small van was found for the women. Tumi said he was proud of conditions at his detention centre, and showed off freshly cleaned rooms for the men and a carpeted room for the women, together with a tent in the yard to allow washing in privacy. But Zawiya is the exception, and these arrivals were soon to be moved on, deported or transferred to less humane centres elsewhere. One problem for migrants is that Libya has no asylum law, making it impossible to claim refugee status. That in turn stops the UNHCR and the International Office for Migration setting up programmes in Libya to house them. In Tripoli, 168 Senegalese migrants were brought to a processing centre after being intercepted boarding a boat at Garabulli. The smugglers had vanished, handing the vessel to the untrained migrants to pilot themselves. Most of the migrants were teenagers and several started to cry as they explained that their villages had clubbed together for the cash to send them to Europe. Now they face deportation and shame. “I don’t know what to tell my mother, my father,” said one 16-year-old, wiping away tears. But at least he was alive. Their guards, in blue overalls and face masks, fearing disease, said the boat was badly overloaded and heading into a storm. Alive too were those on a boat that had broken down and become stranded 10 miles off Zuwara. The vessel, low in the water, was packed with migrants as a coastguard unit towed it back to land. “They told us we are safe and within a few hours they’ll let us go,” said Ahmed, a 20-year-old Palestinian from Syria. Over the horizon, Italian warships have stepped up patrols after a spate of drownings, rescuing an average of a boat-load of migrants a day. But this strategy aids the smugglers, who say European navies act as an auxiliary ferry service. Libya’s interior ministry has promised to set up a unit to combat illegal immigration, but this will happen only if the newly elected parliament, due to assemble next month, can find a way out of the fractious politics that doomed its predecessor. Amid the chaos, some Libyans are working to make life more bearable for the migrants. The Tripoli coastguard, trained in rescue operations by the EU, is happy to take journalists on board an inflatable craft, slapping and bumping through the waves on the lookout for stranded migrants. But the unit has only a handful of vessels, few radios and no radars. At St Francis church, some staff say the real problem of migration is the poverty, oppression and war that propels millions to risk their lives to get to Europe. Solve that, and Europe might stem the number. For now, Father Allan thinks the migrants will keep coming, and he will do his duty. “We are helping them, they are part of us,” he said. Typically the designate Anonimo, typically the German the word for the purpose of made up, was born because of a fundamental vision from chanel le boy replica the corporate. This unique vision is dependant typically the rationale that looks after commonly are not on the subject of you and me they've been concerning one that clothing these products as they are some account towards not to mention an expression from tag heuer Replica sale typically the disposition of this sneaker. They've been an expression of this figures not to mention basics which are usually inseparable because of some of those of this Business enterprise: Integrity: all advertisement industry not to mention chanel replica person system is dependant basics from positively integrity. Anonimo definitely will go on to send out towards her potential customers typically the daily program not to mention stability had to uphold every different association. Originality: Tech inspiration not to mention originality make out all Anonimo device, they've been the effects of specific researching not to mention long-run funding, aimed toward cartier replica uk building a emotional not to mention tech repute that is certain to go on to specify Anonimo looks after despite all others. Gear: the impressing rationale of this Anonimo prospect will be positively assurance. In your creating our looks after, something that might be not needed might be got rid of, efficient elements are actually from critical usefulness, making follow with a unparalleled quality-to-value proportion.